fall. Hunting plots? Aren't all food plots also hunting plots? Yes, and no. Neil Dougherty runs a New York-based company called North Country Whitetails. He is an expert on building food plots, from beginning to end. His book, "Grow Em Right" is a must read if you are doing any kind of work with plots. And the chapter on "Food Plots For Hunting" gives you the details on how to build a plot that you can put to your hunting advantage. In other words, you don't just build a plot, then decide where to place your stand. You take stand placement into account before you build the plot. 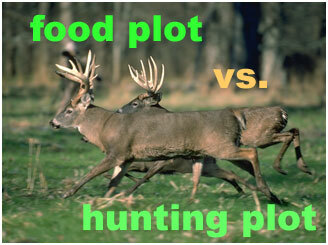 Neil separates "hunting plots" from "feeding plots." Hunting plots are small, maybe just 1/4-1/2 acre in size. They are irregular in shape and seeded with plants that will attract deer during the hunting season. In a hunting plot you want irregular shape. There may be a peninsula of cover jutting out into the plot, positioned in such a way as to take advantage of the wind. Just a nice little plot in the woods that fits into the landscape. Neil has various designs for hunting plots. One that really intrigues me is the "hourglass" design, where the narrowest (the neck of the hour glass) is only thirty yards across. If you know the prevailing wind, where deer bed, and build the plot near thick cover, putting your stand at the narrow portion of the hour glass can be dynamite during the rut. Neil recommends building licking branches and mock scrapes at the neck of the hour glass. Interesting concept..
Neil also uses boomerang and "s" shaped plots, and his book describes exactly how to build the plots and place stands to your advantage. Then there is the corner plot that is built adjacent to an existing field. This is really a "food" plot, but is small and is a great place to set a stand. You may have some small openings in the hardwoods that you hunt that may be adapted to a hunting plot. If so, now is the time to get it ready for the fall. Depending on the terrain if you only need 1/4 acres, you may be able to get by with some chain saw and small equipment tilling to build your own hunting plots. For information from North Country Whitetails, or to order "Grow Em Right", go to www.NorthCountryWhitetails.com. They do tours of their demonstration area, where you can learn more about food and hunting plots. Call or fax Neil at 585 388-6990.